As a collaborative development project, ACCESS is involved in the expansion of a primary school in Jamaica. Ken Cooper, a Brampton, Ontario resident, took time to visit the school he attended 36 years ago while on a recent trip to Jamaica. 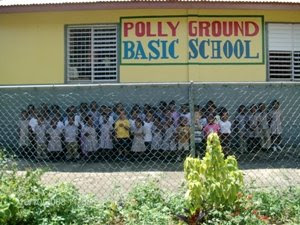 Polly Ground Basic School is the equivalent of a pre-school in North America for 3 to 5 year olds. It is located just over two hours east of Montego Bay and two hours west of Kingston, in the middle of the Island. It is in what is considered a rural area. Ken shares his experience in Jamaica, which was the inspiration to initiate the Jamaica Project, for which details follow. As I walked through the doorway, I noticed how crowded it was. The one room school had been divided into 3 classes, by 2 blackboards. Although many of the children were already at school early, the majority had not yet arrived. There appeared to be little room for others. I also noticed the temperature difference between outside and inside the school. It was hot, even for Jamaica, and it was not yet 8:30 am. I introduced myself to the first adult that I saw. She happened to be the teacher and also the principal of the school. I told her that I was a former student and just wanted to see the school. She allowed me to look around and speak to the children for a few minutes. After making conversation with the principal about how little things have changed she asked if I was in a position to assist her with increasing the size of the school. She went on to say they are in need of the basics things like books, pencils, paper and even toys for the kids to play with. But the most important thing she mentioned was increasing the size of the school. I asked, “Isn’t there a school board that is supposed to look after these things?” She said we would be better trying to do what we can for ourselves. I told her I was not in a position to assist her by myself, but that perhaps I could ask some others to assist. She requested, “Maybe you could get us a fan”. I said, “Sure, I can do that”. She asked, “can you get three since we have 3 classes?” By this time all the children had arrived for school. The small one room school was now housing over 50 students. The schoolroom was full, it became hotter and the noise level was incredible. I was shocked to see that there were 6 kids sharing the same desk simple because there was no space to but another one. I went to the market later that day and purchased 3 wall mounted fans and installed them the next day. When we turned them on and the papers started to fly around the children started to laugh. The all said ‘thank you’. The feeling I was left with was like they had given me a million dollars. It was awesome! The school is currently 1300 square feet in total. The main goal of this project is to build an additional 800 square feet so that the children will have a better learning environment. Additional funds will be used to purchase books and supplies. In January 2009, a fundraiser was held in Mississauga, Ontario raising over $4,000 through various activities including a silent auction. The total goal for this project is $16,000.00 CAN, or approximately one million dollars Jamaican. Donations to the project can be made online through ACCESS by clicking here. Tax receipts are available for donations over $20, and must be made via cash or cheque. To inquire about donation details please email info@accesscharity.ca. For updates on this initiative, please visit jamaica.accesscharity.ca. ACCESS: Allowing Children a Chance at Education, Inc. is a youth-run organization aiming to provide needy children in the developing world with school uniforms and necessary school supplies, enabling them with the opportunity to obtain an education for decent employment and a successful life. ACCESS also aims to educate North American youth about related world issues, and to inspire them to make a difference globally. For more information or media inquiries, visit www.accesscharity.ca where resources including project details, and photos and video are available.